My friend Kim took the hand of Jesus and walked into eternity yesterday afternoon. It was the saddest day of my life so far. Yet, I am forever thankful that God allowed me to be part of her life and her family. Please pray for Mike and the kids, Jessica (12), Grace (7) and Matthew (4). Please lift up her mom Linda, her sisters Laura and MaryJo and her Brother David. They are so broken. Also Mike's family (Mike Sr., Ebbie, Celie, Kaylan) who loved her dearly and will be so needed to fill in the gaps in the days ahead. This week has been filled with many ups and downs, kinda like a seesaw. Up went my heart when I saw Kim on Monday and she looked so much better than I expected. Down went my heart when her mom called to say her lungs are filling with fluid. Up went my heart when we were assigned a travel date to Ethiopia. Down went my heart when I realized I'd have to miss the D6 conference. Up went my heart when we JJ told me there's another date option that gives us an extra week to get our shots, plane tickets and plans in place. Up and down went the seesaw of my emotions, and then God reminded me of something I'd just read on the blog of my oh-so-wise friend and assistant, Leah. She said I could share it with you. I pray you'll be as encouraged as I was. Summer break ended this week. At 6:00 am Tuesday morning, my children tumbled out of bed, my husband got dressed to take them to the bus stop, and I stood in the kitchen making breakfast and packing lunches. Thinking about it makes me a little sad. The last three months have gone by so fast and, as I take time to reflect, the best words to describe our Summer break would be a wild seesaw ride. 1. an up and down, back and forth movement or procedure. Up: Our nephew, David, decided to come live with us during his college break. He's been such a joy. Somehow he has this amazing way of keeping Brody and Carson from getting on each others' last nerve. Down: Two days before school let out, I hurt myself playing tennis and tore a bunch of ligaments in my foot. I spent the first four weeks of our Summer break on complete bed rest, crutches, and visits to my physical therapist. Up: Our oldest son, Brody, went on a mission trip with a city wide youth choir. While on tour, he had some incredible life changing experiences and spiritually grew closer in his relationship with God. Down: My husband, Keith, didn't get that really big construction project he had worked so hard on. The potential client picked someone else which meant no income for us.... again. Up: Our son, Carson, went on his very first away camp to Look Up Lodge. Although he was very hesitant about being away from us, he returned home with a huge smile on his face and said he wants to go back next year. Down: A couple from California is interested in buying our home. I know this sounds like an "Up" but it's not really. This was our dream home and secretly I prayed we'd be able to stay here for many years. Our family has so many wonderful memories and te thought of leaving brings me to tears. Up: My sister flew in to stay with me for a week. I was so excited and loved our time together. Down: We had to cancel our family trip to Washington D.C. because I wouldn't be able to walk around on my injured foot. 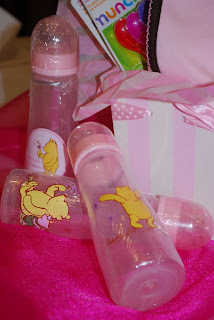 This decision left me with serious mommy guilt that I've had to work through. Up: We rented a mountain cabin with friends and went to the Biltmore Estate. We had a fantastic time, relaxed with friends, and saved a LOT of money too. Yes, it was a see-saw Summer for our family. We've gone back and forth on many big decisions that will drastically effect our future. We've been guilty of changing our opinion about people and things. We've had good and bad attitudes and vacillated multiple times on what direction we should go. But...God never changed His opinion about us and never vacillated in His plan for our future. Something wonderful came out of this See-Saw Summer. Through all the Ups and Downs, I can honestly say that we did see the hand of God move in our lives this Summer. We have watched as He has orchestrated our circumstances for good. In the center of this crazy ride, we saw doors open and situations unfold which confirmed His love for us. God's daily provision guided us through some very rough waters. Yes, it certainly has been a See-Saw Summer. One that has brought our family closer together. One that has strengthened our marriage. One that has drawn us to a place of total dependence on God. One that has lead us to the feet of Jesus where we have found rest, renewal, and strength. One that our family will never forget. Don't you just love that verse and what God showed Leah through the ups and downs of her summer? It helps me to "see" what God is doing and believe that one day I'll be able to tell others how I "saw" His faithfulness again and again. Thanks Leah! And thanks for choosing the winner for me of last week's give-away for my "Beyond the Shadow of Doubt" message on DVD. Congratulations Monica! This morning I woke up with a deep sense that my heart needed to do some surrendering. I couldn't sleep. My mind was busy processing my day, my week, my month, my new season of life. Things to think about. Decisions to make. Changes to process. As much as I wanted to rest, I needed to run. As much as I wanted to run away, I needed to run into my sanctuary. A place of bittersweet surrender - a room without walls. A floor of hot pavement that winds through neighboring streets. Running is my physical response to my spiritual need, where I release my thoughts and plans; my concerns and commitments; my questions and answers to Jesus through the ache of my legs and the groans of my prayers. Surrender~ when I empty my hands and my heart of all that I am carrying, all I want and need. Why is surrender so hard? Is it because we're afraid to let go? Yet, why do we wrestle to hold onto, and fight for, what we cannot change or control? Today, I had to let go. My prayer of surrender sounded something like this..."God, I can't do this thing you call my life. Why are you allowing so many things to happen all at once? I want to know when we are going to Ethiopia. Have you seen my schedule this fall Lord? Uh. Yes, I remember. I prayed about it and You arranged it this way. But a baby? A new school? A book? Speaking in far, far away places. Late night flights home. Trying to decide whether to take Aster. It's too much for me to figure out. I need you to give me peace. I need your wisdom and direction. Some supernatural time management would be good. Getting all the things I want to get done so I have a jump start and will be ready when Aster gets home. I need you to show me what to do first and then next. I know God. I need to surrender. So I'm gonna stop asking You for what I need and start remembering that "You" are already all that I am asking for. You are peace. You are wisdom and direction. You are time - my Alpha and Omega-the beginning and the end. You are the orderer of my day. You are my God. You are life. You are wise. You are completely in control. And I trust You. I surrender all of me for all of You. Please make room in my day for all that You have planned." Soon after, I noticed my heart felt free. By relinquishing my rights to manage my burdens and blessings, a load had been lifted. My hands had been raised. Palms open. Heart willing. Desperately needing to let go of what I cannot hold or handle on my own. An hour after I got home, the phone rang. God answering my prayers, but not the way I hoped. I was so very glad I had spent the morning in surrender, because it prepared my heart for the way He was about to rearrange my thoughts, my emotions, my day and my perspective. It was Linda, Kim's mom, calling. Some of you have prayed for Kim, leaving notes and promises after I posted about her battle with breast cancer this May. It's been two years since she was diagnosed with stage four. Kim, an adoring mom of 3, has been fighting and praying hard to win the battle. 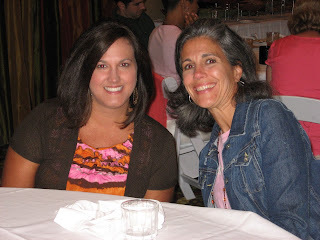 In just a few hours I would be sitting beside my sweet friend Kim in the hospital looking into her beautiful blue eyes and wondering what she's thinking behind that tired smile. The doctors told them this morning that they are out of options. High levels of ammonia in Kim's blood indicate her liver cannot function. Her spleen is inflamed and hoarding platelets, leaving her with a count of 4 as of this morning. She's been in the hospital since Friday. Hospice was called today. They are doing their best to grant Kim's wishes to be home by Wednesday. After a meeting with JJ at our boys' new school, I headed to the hospital for the day. Things change so quickly in times like these. Suddenly I didn't care what I needed to do. As I drove to see my friend, my heart was overwhelmed with a whole new set of questions, burdens and needs. Why God? School starts tomorrow. Her kids need her!! Why now? Michael's so scared. He needs her. Her mom is going through so much. They all need time to plan and think this through. It's not fair. Why are you allowing this? What do you want me to do? Pour it all out again. Making room for what God has for me and for Kim right now. Remembering Who He is. Remembering the great I Am. The Alpha and Omega, Kim's beginning and end. Surrender. And so here I am again. With a heavy heart. Carrying a load I cannot handle or hold. Trying to let go. Trying to remember. Trying to surrender. 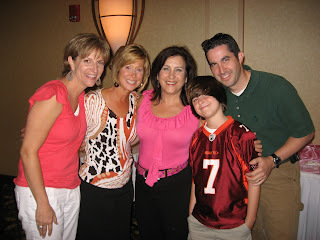 If you'd like to know more about Kim, see photos of her family or leave a note for her, her husband Michael, and their kids Jessica(12), Grace (7) and Matthew(4), please visit her Caring Bridge site at http://www.caringbridge.org/visit/kimwhisenant Please also pray for her mom and the rest of the family. Also, I've asked Leah to choose a winner for my "Beyond the Shadow of Doubt" message on DVD, drawing and we'll be annoucing that on Wednesday. 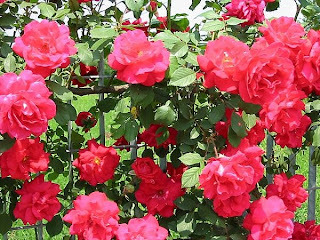 I shared today in my P31 devotion that I re-planted each section of the rose bush so that it could become a display of pink glory across my whole split-rail fence. And God used that rose bush to prepare me for some re-planting He was about to do in my life. Just like the uprooting of my rose bush, some of my life's leaves wilted, petals fell to the ground and a few of my branches produced more thorns than blossoms - at least for a while. God was pruning my ministry and my life, teaching me how to surrender my plans for His. It was hard. But God was doing a new thing and allowing me to perceive it. (Is.43:19) That was five years ago and I can say without a doubt that I wouldn’t be the woman I am today if He had not uprooted me and planted me in a new place, with new dreams. It’s easy to doubt God, ourselves and our futures when our lives feel uprooted and our dreams fall apart. For years, I had allowed pain in my past to hinder me from trusting God with my future. I allowed insecurities and fears to keep me from living in the assurance of His promises and the confidence of His love. The only way I could surrender my former soil was to get rooted in God's love. So I spent time with Jesus. He was all I had. Each time I wanted to cry or run, I took the broken pieces of my heart and my will and gave them to Him. I was honest with Him about how I felt. How disappointed I was. How mad I was. How hurt I was. How scared I was. As I asked Him to help me understand, I began to see How God could reveal more of Himself through me as I depended more on Him. Eventually those around me would enjoy the new blossoms that were produced through my surrender.. I read through the book of John, journaling each time I noticed Jesus laying down His comforts, His familiar places and people, His rights, His life - to bring glory to His Father. And each time I would let go a little more. It taught me absolute dependence on God like I had never known and changed me from the inside out. I came to new place of trusting Him and experiencing His glory in my life and in my family. Even now we are living out the lesson of the rose bush as we make room for a new "planting of the Lord" in our lives. I invite you to read through my posts last week and see our little crown of beauty: a display of His glory revealed through a little girl who's becoming part of our story! What is God asking you to surrender? I'd love to know so I can pray for you! And if you'd like a chance to win a copy of my "Beyond the Shadow of Doubt" message on DVD, be sure to click on the word "comments" just below my name, then type in the white box. If you don't have a blog, just click anonymous. It'd be fun to know your first name, age and city (& email address so I can let you know if you win)! My heart is racing with excitement about everything God is doing, and at the same time God is slowing me down; making sure I wait on Him. For the past few weeks we've sensed God might be leading us to take our boys out of public school and prayerfully walk towards applying for a small Christian school. Andrew is so happy! Joshua is not so happy. This is traumatic and very upsetting to him. He's wants to go back to middle school with all his friends. School is starting in a week. We had to make a final decision by Sunday night. There was testing they had to do last week and placement that had to be decided this week by the new school. We were completing applications and needed to take our paperwork to the new school and request records from the old school on Monday. Joshua still had to complete a new student questionnaire, and I wasn't sure how that would go over. I woke up in such a bad mood Sunday because I don't want to be in this hard place. I want to be in a happy place, focused on my new baby and soon-to-be book. But all the blessings in the world don't matter when a mother's child is hurting. All the celebration and joy a baby and book can bring can't take away the pain of seeing my son so sad. I cried Sunday morning. Driving to church, I begged God for clear direction that these are indeed His plans and not ours. I got there just in time to hear the sermon about our mission in life: to find our joy in Christ and not in anything else. The final point being that we are like John the Baptist, preparing the way for others to know Jesus and find life in Him as well. God's peace sunk deep into my soul. Our role as parents is to prepare the way for our kids. The message confirmed why we feel called to send our children to this school. The school's goal is to bring learning to life and give kids a Biblical world view while leading them to find life in Christ. God kept the confirmations coming all day Sunday. JJ and I spent more time praying and writing down what God had done to confirm His direction. We made our decision and took the next steps of faith and obedience. Now we'd watch to see if God would open the door for them to get a spot at the new school. Everything was in place. PS.Thank you so much for your prayers and precious notes last week. I am saving them all for Aster! ASTER is officially OUR LITTLE GIRL!! Yesterday we spent the whole day on the beach, enjoying the moment we were in and trusting God for all that He was accomplishing far, far away in Africa. Since Ethiopia is seven hours ahead of us, by the time we went to the beach it was the end of the day in Addis. During our picnic lunch we got the call!!! Susan from A.A.I. called to tell us all of Aster's adoption paperwork was completely approved yesterday in court!!! She is ours! How sweet of God to have brought us to this place - not only spiritually but physically. That we were all together on a beach where we have made so many family memories was the perfect setting! We will never forget the day, the time and the place our lives changed forever. And there will be one more of those when we travel to get her - hopefully in late September or early October. Aster came into our lives just over 2 months ago when we got a call on June 9th telling us that there was a baby girl who could be ours. This was a big shock since we had planned to adopt an older girl (4-8) or two. BUT GOD!!! Here are photos of Aster we've been dying to share with you! God has done great things and we are filled with JOY!!! 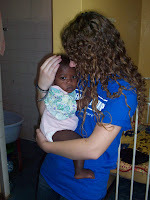 May 1, 2009 - The day Aster got to the orphanage. She was 6 months old and weighed only 8 lbs. She is so thin, so lethargic and very malnourished. We saw this frail child as evidence of a loving mother who couldn't bare to see her baby die. I can only imagine her sorrow as she searched for help and sacrificially found for her baby the love and care she needed, that she as a mother could not provide. 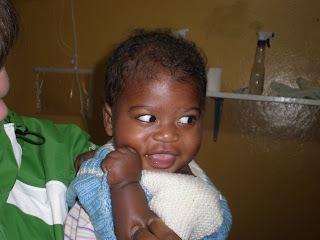 May 26, 2009 - Only 25 days after Aster came to the orphanage she weighed 14lbs! My doctor didn't believe at firs that this was the same child. But we were thrilled to see that she was already thriving. In just over three weeks she had almost doubled her weight. June 25, 2009 - Hope TerKeurst holding Aster during a visit to the orphanage while she was on a 6-week missions trip to Ethiopia. It had only been 10 days since we accepted Aster's referral. To read more about Hope's visit click here. 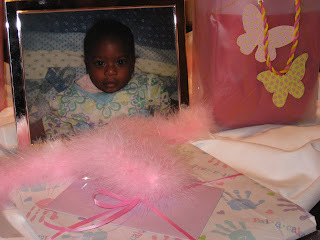 July 11, 2009 -Isnt' she beautiful? There is another amazing God-story about how we got this photo. I'll share that one next week! Thank you friends for your prayers and your part in our little miracle. And THANK YOU my sweet Jesus for Your favor and grace. I am humbled by all that you have done, are doing and will do! with a mommy who had to give up her little girl. she noticed how her tears turned the dust into clay. she prayed and trusted in the kindness of His plans. 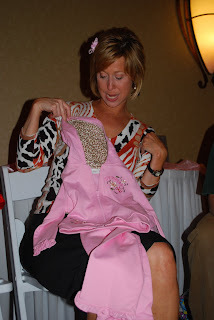 who prayed and dreamed about her "soon-to-be-little-girl"
She asked God to surround her with loving arms to hold. her child a future and a Hope (TerKeurst), too! mother's prayers were answered by a touch of God's grace. whose life would be defined by God's grace, redemption and hope! petals radiating from a center disc. Wednesday night before She Speaks, my very precious friends surprised me with the most beautiful baby shower I've ever seen. It was breath-taking! 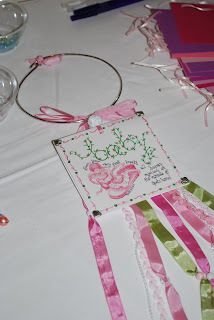 The decorations were flowing, frilly and all things girly! 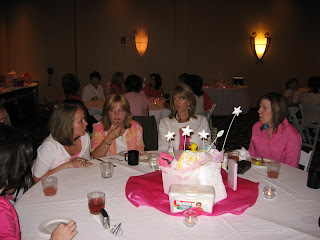 I was shocked and blessed beyond words as I discovered my friends, all dressed in pink, lining the walls of a huge conference room. 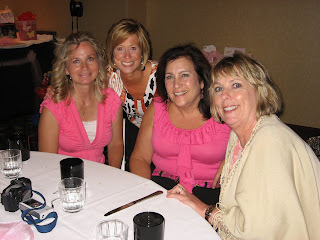 Funny how I hadn't noticed Leah, Holly and Lysa were all wearing pink to dinner that night. That's LeAnn to the right. 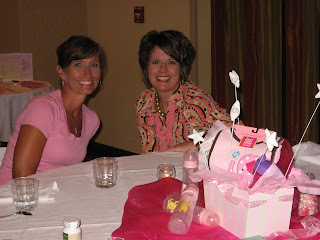 She's the mastermind behind the most beautiful baby shower I have ever been to! LeAnn had each person write a prayer for Aster and then string prayer beads that will be her's forever! This was one of the first gifts I opened. I laughed as I looked at this photo because my face shows that I was in shock. I couldn't process that we are actually going to have a baby who needs a teddy bear and maybe a harness tied to it. At this point, we have gotten to cute clothes and I am doing much better mentally. Oh, and cute purses. Now I can handle cute purses! 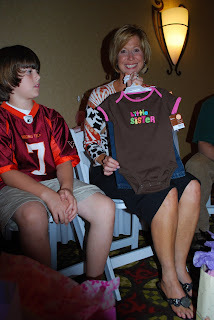 I love me some pink and chocolate brown onesies that say Little Sister! The sweetest gift of all is the love and prayers of my friends! And their beautiful smiles, too!! Even my friend Cris from California got here in time. That's Suzie on the left and Ashley Whalen. 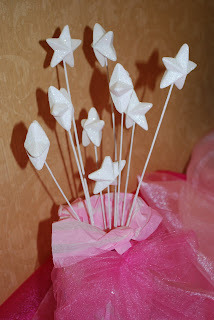 The centerpieces (created by Samantha) had themes. Marybeth, Luann, Leah and Suzie. 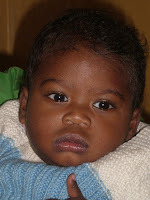 Today is the day Aster's adoption paperwork will be reviewed in court in Ethiopia. Please pray with us that everything goes miraculously smooth and that if there are any obstacle they will be easily overcome before the courts close August 21st. We may not hear anything right away but we promise to keep our blog updated as soon as we do! Thanks ya'll!! 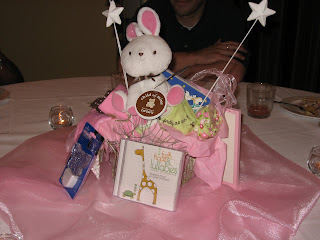 After basking in the afterglow of She Speaks, I am now living in the "Aster-glow" of our soon-to-be baby girl. The ride of our lives got very exciting, adventurous and a little crazy last week! Last Thursday we received an email from our adoption agency telling us that the courts in Ethiopia are closing August 21- October 5th. We felt so sad because Aster's paperwork had not even been sent to the courts, much less assigned a court date. I decided we should cancel our vacation (this week) and go to Ethiopia to see her before schools starts. That way we'd get to hold her before she outgrows her desire to be held. And when it's time to bring her home, after she finally gets through court, one of us would go get her. We already saved up for all of us to go, so it made sense to my aching heart. On Friday morning, I went running and God talked sense into me. He reminded me that sneaking babies out of orphanages would get me into big trouble, and seeing her would make me want to do just that. So I started imagining why God would think it best for us to wait until at least December to bring her home. I determined that it must be my speaking schedule, book writing and other big things we have going on that He was carving out time for. Once I'd figured out His plans (ha!) I was able to relinquish my desire to hold Aster. By the time I finished running and praying, I was at peace. I took the boys to a friends that morning and headed to work. On my way, I called JJ to see if he'd call the agency just to make sure they hadn't forgotten to tell us Aster has a court date. Around lunch time he called me back to say he had great news! Aster had just been assigned a court date and it is THIS WEEK!! THIS WEEK - as in day after tomorrow - THURSDAY, AUGUST 13th!!! If everything goes smoothly and her adoption paperwork gets approved before the courts close August 21st, we could travel to get her in Ethiopia as early as mid-to-late September. I was SOOO EXCITED!!! I practically hung up on JJ and ran to the P31 conference room so I could squeal and tell all my P31 teammates! Then all the sudden that peace in the morning that turned into excitement in the afternoon became an overwhelming nervousness. "THIS MEANS I COULD HAVE A BABY IN JUST OVER A MONTH!!" Then all those reasons I figured God was delaying her coming home flooded my mind. How was I going to get all that done? And what about the other big news I'd just gotten? An email had come that day announcing that two publishing houses are taking my book proposal to their pub boards (decision makers) TODAY, yes today, and next MONDAY. Oh, and I haven't had a chance to tell you yet, but we've been prayerfully considering making a huge change in our boys' schooling, and school is about to start in 2 weeks. If I could just focus on getting my schedule, Aster's room and our home/family ready, I'd be good. But who gets to have that kind of perfectly arranged life, right? As much as I wanted to start nesting, I couldn't. We had company in town, parties to go to, interviews at a new school, academic testing yesterday that we find out results for tomorrow, and vacation scheduled out of town. In the midst of all this BIG NEWS, we prayed (A LOT) and decided to come to the beach. So instead of Ethiopia, that's where we are! And I am so glad to be here. It's a big week and I am thankful for my BIG GOD who is able to take care of all that concerns me. He can handle it all so much better than I can. 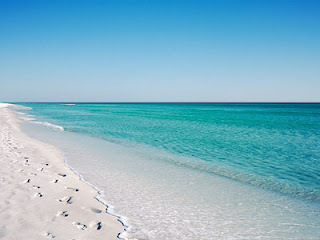 Today, I will be sitting with Him watching the endless waves and looking over the countless grains of sand, knowing that His thoughts about me and my family outnumber them all. I think the Aster-glow of this baby girl is about to change a lot about my life - more than anything my perspective and my trust in the One who is about to give her to us! One of the things I love most about the days following She Speaks is reading all of the stories and blog posts describing how God met each woman there and spoke to her heart. This year it's taken me several days to settle in at home and get to a point where I feel like I can take time away from my guys to visit my girlfriends and read their stories. I am so looking forward to it. Every story is different and personal, powerful and beautiful. Even the simplest detail of God speaking to His daughters through a specific verse, conversation or unexpected gesture is breath-taking in my opinion. Some stories are funny. Others are tear-jerkers. Many stories leaving me wishing I were invisible so I could've listened to words being shared, prayers being whispered. Jesus met many of us in the Prayer room - kneeling on Holy ground as we read the names of God layed over our own - what an anointed place. Hearts were stretched in speaker evaluation groups, I know. And many women surrendered their dreams and hearts before and after each publisher appointment. My heart longs to read and thank God for the hundreds of stories that were written in our lives. I'd love to know what promise He gave you at the Cross on Sunday (there were 15 different ones printed on 600 different cards) and/or His name that was lying under your name in the prayer room. If you or someone you know has posted their promise or a story on your blog, please leave a link in the comments box. If you don't have a blog, I'd still love to hear your story. You could share it in my comments for me and others to read or email it to Renee@proverbs31.org and I'd like to share some of it here. I can't wait to read and pray over each of you this weekend. Why is my brain happy about that message? Because it's a really tired brain today and it's holding me to the fact that I need to "rest." 4 "In those days, at that time," declares the LORD, "the people of Israel and the people of Judah together will go in tears to seek the LORD their God. 5 They will ask the way to Zion and turn their faces toward it. They will come and bind themselves to the LORD in an everlasting covenant that will not be forgotten. 6 "My people have been lost sheep; their shepherds have led them astray and caused them to roam on the mountains. They wandered over mountain and hill and forgot their own resting place. Have we forgotten our resting place? I believe we have. At least I know I do. I am definitely not a "resting" kind of girl. In fact, I'm such a doer it's kinda scary. Like the time I was trying to "rest" but felt so restless that I decided to go for a walk. When I got back I realized that in all of my inability to rest, I accidentally took my dogs medicine instead of mine. So what did "rest" look like for me today? Well after sleeping in, my friend Cris and I drove over to meet Lysa and Holly to go running. Doesn't sound restful does it? But it is for me because my brain has the hardest time resting and running doesn't require me to think. Plus it was a great way to keep myself off the computer where work begins and rest ends. I also loved easing back into life by spending over an hour with my girlfriends sharing our favorite She Speaks memories and moments. Holly even cooked us all poached eggs after we ran. Afterwards, Cris and I picked up my boys and headed to the P31 office to help unload the She Speaks Uhaul with the other P31 team and kids. Still doesn't sound restful? Call me crazy, but it was. We laughed, we talked and just enjoyed sweating and being together. The biggest lesson for me has been that resting comes in many different forms. Sometimes rest means I need to sit still and do nothing. But not always. Often rest comes when I stop my mind from being active with plans and deadlines, but making myself be active physically with family and friends. The physical activity distracts me from the restlessness I fall into in my thoughts. So, how do we know what rest looks like each day? It really all depends. I've got to ask the One who calls Himself my "resting place." I have to start my day sitting in His presence and listening to His lead. Sometimes it looks really spiritual with me sitting in a chair reading my Bible and journaling. Other days it looks more like me laying in my bed asking Him to be my first thought, my first breath, my first desire. Sometimes it's just me giving Him my plans and being willing to not make any of my own - on days when I have optional white space. On days like today, He nudges my heart to go with the flow and follow where He leads me - to a place of rest. A place of rest that may not even look restful to others but for my heart it just the "resting place" this non-stop thinking girl needs to be. If you were at She Speaks, I'd love to hear what rest is going to look like for you this week as you return from the conference and begin to process all that God wants to give you. Share with me in the comments and I'll be praying for you. Once again She Speaks is more than we could have asked for or imagined! I can see God's answer to every prayer and His activity in every detail and thought that went into planning the conference. What an incredible team we have at Proverbs 31 Ministries. God's girls and God's plans are in motion this weekend! I think this might be the best She Speaks ever, but then again, I feel that way every year. The women who come are just incredible. I met with two publishers today who went on and on about the women they have met and their stories. They are super impressed!! Thank you so much for your prayers as I prepared last week. And your continual encouragement now as I speak and serve this wekeend. My sessions have gone well from what I can tell. I am living on adrenaline and Jesus! It's been sooo hard to sleep. Just too much excitement and anticipation for my heart to handle. The first night I went to bed at 11:30pm and woke up at 4am. The second night I went to bed at 2:30am and woke up at 6am. That night I was up reviewing and revising my Friday morning opening message about "Seeking Vision and Not Position." Once the conference really started I was able to settle a little so last night I slept from 11:30 - 7am. Today I met with three publishers about my book proposal. Once told me that their editorial board wasn't interested but that she wasn't going to give up. Another said she loved it and is very interested. And the third said she really liked it and is presenting it to her editorial board next week. Yaaayyyy!!! I also have another publisher who told my agent that they are interested but they aren't here so I haven't met with them personally since they got my proposal. Let's just keep praying and see what God does.